Sorry that this website was offline for the last week, I hadn’t checked. It’s back now. Anyway, how do you write about your favorite games? I’ve often found it harder to write about games I really love than anything else, which is part of why I’ve rarely said much about some of my favorites. Well, after going back to start playing this game again a few months ago after a new patch was released after many years, I got hooked on Guild Wars again and it made me decide to write some posts about it. I will be writing a longer summary of at least some of the reasons I love this game so much, but I decided to start with this, a screenshot-heavy look back at the early days of Guild Wars. It’ll take a bit to get to the screenshots, but if you scroll down there will be a bunch of them. The screenshots in this post are all ones I have posted on several forums years ago, but that was before I had this site and I never posted them here, and as I started playing the game again recently, I decided to finally post them here too! While the screenshots are not new though, most of this text is; I didn’t just re-use my old posts from 2004 and 2009, though I did go back to them and incorporated some parts of them here. This also will not be the last Guild Wars screenshots-and-text post I will write, I am planning more soon. I know that it might be better to start with something more like a review that explains how the game plays and such, but I want to start from the beginning, and the beginning is when I first played the game. Guild Wars’ best days as a game with an active community are behind it, and that is an issue for new players, but I want to remember how great the game was, while also appreciating how amazing it still is, with this series of posts. Now, most of the screenshots on this site aren’t mine and are just there for illustrative purposes to show what the games in the text look like, but this is different: all of these screenshots are my own. They are the story here as much or more than the text is. This article has more text than later ones in the series will, but it still does have 30 screenshots of mine. 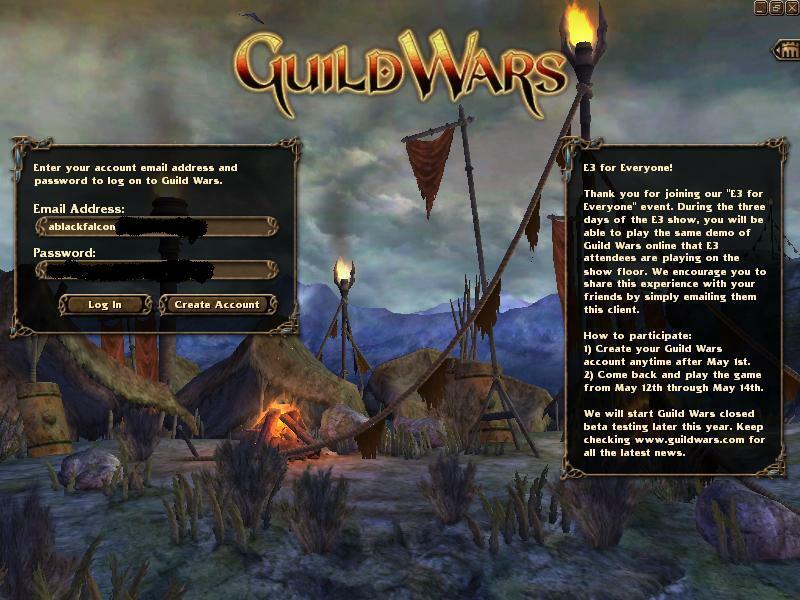 Guild Wars, for anyone who does not know, is a cooperative online role-playing game, or CORPG by its own description. This is a game of skill, where planning and strategy matter more than anything. I think that CORPG is an accurate genre listing to put the game in, because it is somewhat unique. Mixing elements of massively multiplayer RPGs, collectible card battle games like Magic the Gathering, and single-player RPGs, while removing most grind and leveling requirements, Guild Wars is a unique mix which is nearly perfectly suited for what I want out of an online RPG. Guild Wars is a unique mixture which somehow fits perfectly together. It is a singularly exceptional experience and has a most-likely permanent place in my top 10 favorite PC games of all time. I will go into more detail about the gameplay soon, after the first small batch of screenshots. The concept here is to go through this test as I did back then though, while also talking about how much I still love this game today, so that will have to wait. With the first Guild Wars Arena.net made something amazing, and it’s still one of the best and most fun games around. I played many hundreds of hours of this game between 2004 and 2007, probably nearly a thousand in that time in fact. It’s surely high on list of games I have put the most time into. However, after ’07 I slowly started playing the game less, as despite its greatness it does get repetitive over time. At the same time I was getting more and more interested in classic games, and the developers switched from working on GW to developing its sequel so new content updates slowed to a crawl. After playing probably 900 hours of this game by early 2007 I had only played 200-something more hours in the eleven years afterwards, until getting back into the game a few months ago that is. Unfortunately, Guild Wars’ developer, Arena.net, hasn’t made anything nearly as good since sadly, as its sequel Guild Wars 2 is a massive disappointment in my book — in fact, despite being decent to good on its own I’d probably consider that game to be one of the most disappointing games ever made because of how much of a downgrade it is from its predecessor — but see my First Impressions article on Guild Wars 2 I wrote years ago for more on that game, I think I covered it fairly well there. So as I said above, my interest in going back to the first Guild Wars originated with a new patch for the first Guild Wars that some Arena.net developers released a few months ago, five or six years after all active development on the game had ceased. This patch did a few things. Most notably, it adds a new graphics option that allows you to enable full-detail models at all draw distances, removing all distance detail reduction that the game previously did. This makes the game look better. Sadly, at the same time, perhaps by accident, they broke all remaining Windows 9x compatibility, so I cannot play the game on my old Windows Millennium computer anymore, like I always could until before this summer’s patch. KernelEx doesn’t work anymore with GW… it’s a real shame, oh well. You can launch the game, but can’t log in anymore. Despite having much better machines, I like playing Guild Wars on that old computer sometimes because it is the first machine I played the game on, and it is the game I played this game on the most — I didn’t get a newer computer until early 2007, by which point I wasn’t playing GW as much as I had for the couple of years before that. A lot of my best Guild Wars memories come from playing it on that WinMe machine which, as many of the screenshots below will show, does not exactly run the game at a good framerate. Heh. So with that, I should get to the point, and talk about Guild Wars as I first played it in May 2004, mixed with comments about how different some elements of it are from what the game later became. As some background, I had been a big fan of Blizzard Entertainment, and their Warcraft and Starcraft real-time strategy games in particular. Meanwhile, online RPGs had been a huge thing for some time, and while I’d never been interested enough to want to try one, by ’04 I did want to see if I’d like them. I really didn’t like the idea of paying a monthly fee, however! I still wanted to pay once and then have the game from then on, as it’d always been. So, when I heard about Guild Wars, an RPG being made by some former Blizzard developers who had built Blizzard’s Battle.net network infrastructure and had done some early work on the then not-yet-released game World of Warcraft, which would be an online RPG but would not have any monthly fees, I was very interested. Blizzard was also working on its own online RPG of course, World of Warcraft. I’m sure everyone reading this knows how that competition turned out, but I still like GW a lot more. Because yes, as soon as I played GW for the first time I was hooked! 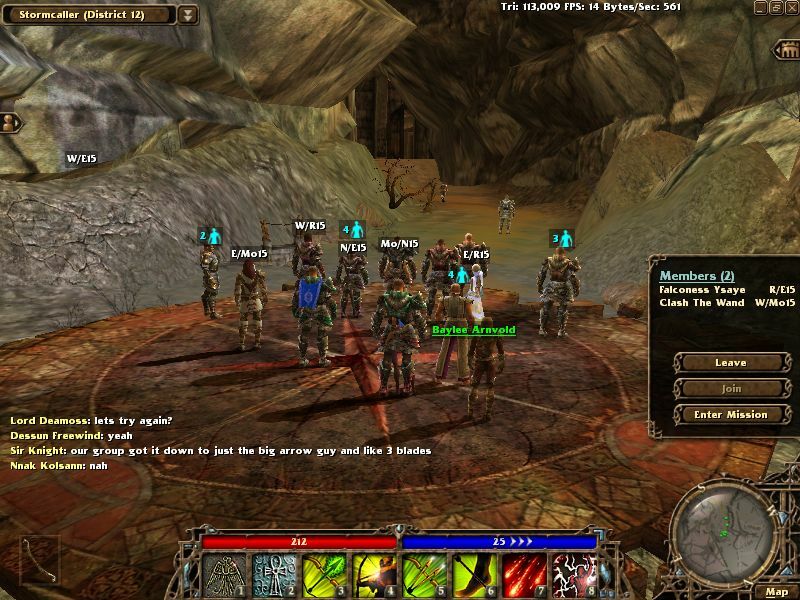 In May 2004, a full year before the games’ release, Arena.net did something special: for five days before and during E3 that year, they opened up a then-alpha version of Guild Wars to the public for free, allowing anyone who wanted to download the client and make an account to play the game for those five days as much as they wanted. Known as E3 for Everyone, it showed the game to be in a pretty impressively complete state given how far from release it was. originally E3 for Everyone was going to be a three-day test, for the three days of E3, but ANet decided to open the game two days early. I heard about this either late at night of day one or early in the morning of the second day, probably less than a day after it opened. In the game, if you hit the Print Screen key it saves a screenshot to a folder on your hard drive. If you hit Shift+Print Screen, it saves a max-graphics-settings screenshot with the on-screen interface off, for nicer shots. Yes, when you press this it’ll flicker on higher detail graphics for an instant to take a nicer shot, if you don’t have the settings set to max. Many PC games have a screenshot function, but I don’t usually take a lot of screenshots of games… except for Guild Wars. I took a lot of screenshots of Guild Wars, dozens over the course of the first five-day test and hundreds more over the years since. I still regularly hit the Print Screen key while playing, when I see something interesting. And I’m glad I did, because that is what made the image part of this article possible! Graphically, the game had come a long way in a short time; on Youtube you can find a trailer for GW from E3 2003, here: https://www.youtube.com/watch?v=ydyueTjyl80 With relatively basic-looking graphics and a much more cartoony, simple look, the game looks nothing at all like it would a year later. It looks like an okay game for 2003, but the 2004 version I first played is dramatically improved over what you see in that trailer. It is fortunate that Arena.net spent the effort to improve the visuals; Guild Wars still holds up well today in a way that I don’t think that 2003 version would. So, when I launched the game, I saw impressive graphics. The first thing you do is create a character. While this game is set in a fantasy world, you can only play as a human in this game. I’m fine with that, it works just fine. Arena.net tried to create a unique setting, so you won’t just find the usual fantasy races here. A few do make appearances, such as Dwarves, Tengu, and more, but most are unique to this game. The sequel continues on with that trend, so it does that right at least. Right from how it starts in a medieval apocalypse, with your humans facing off against giant furry … uh, wolf-men or however Charr should be described, Guild Wars’ setting is interesting. One thing to know though is that each of the games’ classes has an entirely different visual look, so your class choice matters a lot as it determines how your character appears. In the first test all six classes were available, but had only one costume each. Character customization is limited. In E3 for Everyone, all you could do is choose between three hair styles, four faces, four skin colors, and a few hair colors. You couldn’t change clothing yet, so everyone of each class and gender looked the same, until they got some Dyes to change color with at least. Later many, many costumes would be added, but Guild Wars does have pretty limited character customization; there are only maybe a dozen faces, hairstyles, and such available for each gender/class combo, and you can’t fully redesign the face and such, only change your height. Oh well, it’s enough for me. The base game’s six classes are as follows: the front-line Warrior is first, and is a very popular class though I’ve never liked it. The other classes are all ranged: the Ranger who is an archer with combat pets you can send out, though E3 for Everyone didn’t have fully implemented pets yet (they also were thinking about having a stealth component for archers, but most of it didn’t end up getting implemented); the Necromancer, who has stat-down and health-drain skills, as well as summoning undead, though that wasn’t implemented yet at this point; the Elementalist with battle magic — fire, ice, and earth; the Mesmer, with stat-affecting magics and a lot of skills that require precise timing to use well; and the Monk, the essential healing class. In E3 for Everyone, you chose both a primary and secondary class when creating a character. In addition to their unique looks, each primary class also has an exclusive ability that only characters of that primary class have. Your secondary class allows your character to use skills from that other class, but not the other classes’ exclusive ability. For instance, the Necromancer gets mana back each time anyone dies nearby, but only when the character is a primary Necromancer. A secondary Necromancer can use any blood, curses, or death magic skills, though. In the release game you only choose a primary class at first, and pick a secondary later. You can also change your secondary at will eventually, but not your primary. The login screen, during E3 for Everyone, with my password and email partially blacked out. This screen would change in later tests, but this was how it first appeared. The character select screen. I mostly played as the selected character in this first test. Those other two were just test characters I made, and did not keep; I do not remember what I named them. Character creation, E3 for Everyone style. I took shots of all of the classes in the character creator, and it might be amusing to post them all sometime to show which costumes they had and such, but for now this shows what the interface, and female Necromancer outfit, looked like. At the time I thought that the female Necromancer was the second-coolest-looking class, after the Ranger. A loading screen. You saw these screens often. A red-toned version of this art piece is also the one on the small poster that came in the box with the retail release of Guild Wars. I have that poster on my wall now, right behind my computer. This also shows that network tech, as the game is downloading this 288-file chunk of game in this loading screen. Guild Wars is a third-person online RPG. I’m no fan of third-person games in general, really, but this one I love. 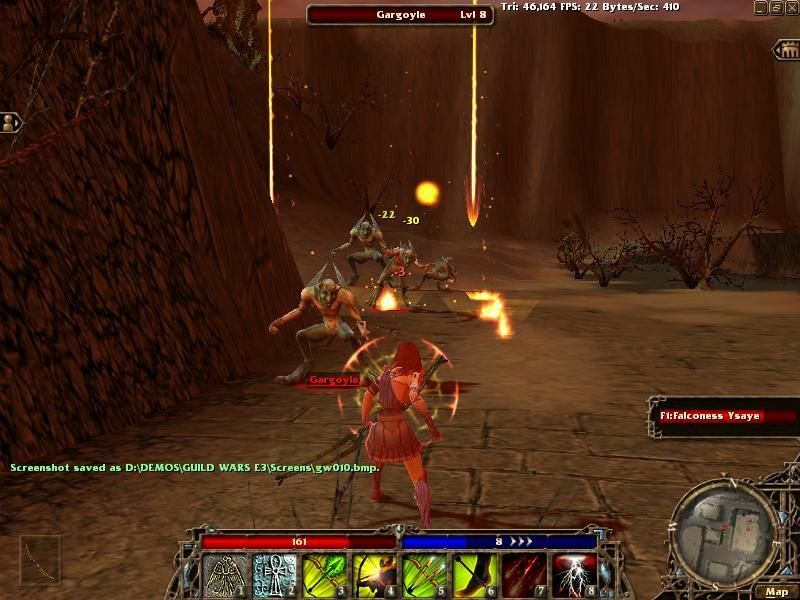 In the game you run around, using skills from a skill bar by clicking on them or pressing the 1-8 number keys on your keyboard to fight human or AI-controlled enemies. You can move in three different ways: with the arrow keys or WASD, you move directly; by clicking on a nearby point on the screen, your character will automatically run to that point; and if you press the R key, you will run forwards until you hit something and stop. All three are very useful at different times, so it’s great they include them all. When you hold the right mouse button you can freely move the camera anywhere except into the ground, which can be helpful or amusing. The mouse wheel zooms in and out. Oh, and the Tab key switches between targets, which is convenient when you’re otherwise mostly using the keyboard. Characters have two meters to watch, health and mana. Health auto-recovers when not in battle, but during combat you will need healing skills to stay alive if you take damage. Mana always auto-regenerates, though usually slower than you’re using it so you need to watch mana usage. Your main interaction with the world comes through your skillbar. 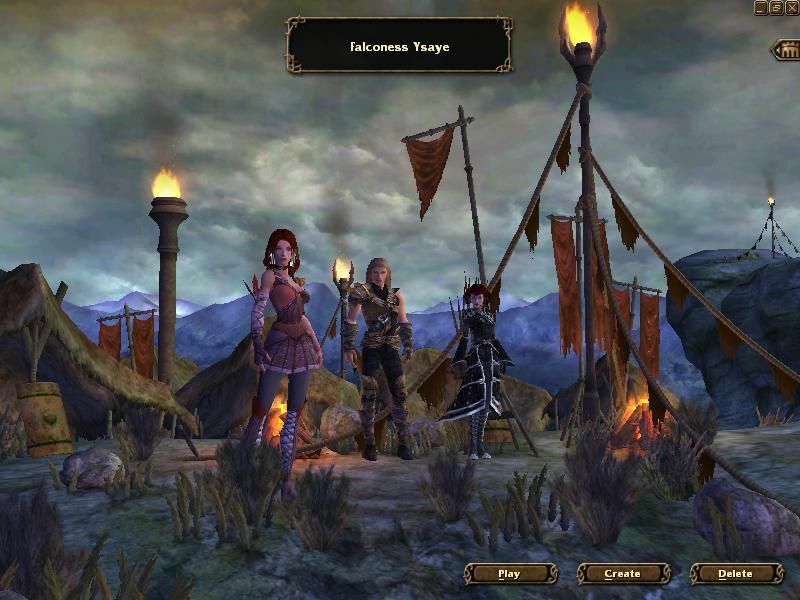 Having a bar on the screen with images for abilities you can use is standard to online RPGs, but Guild Wars has a unique implementation of it. You can equip eight skills at a time, meant to represent skill rings, with eight skills for your eight non-thumb fingers. You are limited to eight skills at a time while playing, and can only change your skill build in towns, while it is locked while in combat zones. Again, this is a game of skill, with a high skill ceiling. When you die, as I have done often, it’s your fault. Getting rid of grind is one of the best things about this game, no question! Yes, you can make a compelling online RPG that is fun for thousands of hours, AND doesn’t have required grind and leveling, or great items that give players absolute advantages. Guild Wars shows that it is possible. This was clear across the board right from this first test, as the test locked players to level 15 throughout. I am someone who hates grind, so this games’ design is the best I’ve ever seen in an online RPG. One other thing unique to the game is that Guild Wars does not have your usual consumable potions for healing, it has skills. This is a game about skills and skill, not grinding and who has the best pile of limited-use items, and I love it for it! Getting rid of consumable items, apart from a variety of silly festival items and boosters they would eventually add, was a fantastic idea which helps make this game great, and I have often wished more games would copy it. Coming up with a good build, or collection of eight skills, is an awesome part of the game as well. Right from this first test the game had a lot of skills available for use, so it was apparent right from the start that finding good combinations of skills would be key, as indeed it is. This is a game with a deep strategic layer in a way you do not always see in the online RPG space, and it has balanced, challenging, skill-based single and multiplayer gameplay as well. Again, it’s an exceptionally well thought through cross between MMO and Magic the Gathering. The way the skill-purchase system worked in E3 for Everyone was different from the released game, though. You start out with a set of starter skills, but could get more by getting skill points through experience, getting skill gems for your class as loot from beating bosses, then using the skill gem at a skill crafter or rare crafter to make a skill ring of that skill. You then could learn the skill from the ring. This system would be refined over time until by release all you need to do is use skill points to buy skills from traders or take elite skills from bosses after killing them with a specific skill that allows you to do that, but I like the ring concept because it explains why there are eight skills. Simplifying skill buying is fine, but the ring concept is important. In E3 for Everyone you could even try out a 9th skill temporarily, though that option would be removed afterwards. One of the great things about Guild Wars is that the game design forces the players to work as a TEAM. You have to work together to get anywhere. The games’ level design encourages this, as you are often moving along clear paths with regular fights against monsters along the way, but so does the way that the classes rely on each other. Warriors go in the front and other classes behind, essentially, with Monks being protected if possible since they are always the first to be targeted. Only characters with very specific builds can go on their own past the very easiest content in this game, and I have always loved it for that. Sure, the enemies don’t have the best AI of all time, but it’s decent enough to make the game fun, and that’s what counts. They attack when you hit a certain range and use skills well. You can see what skills enemies are using, too, which is awesome and very helpful. Now, while Guild Wars does not have potions in the usual sense, you do have an inventory. Enemies in Guild Wars drop materials that make sense for that kind of monster to hold, such as hides, carvings, weapons, and such. The game auto-distributes drops, so each player or AI character in your party gets an equal share of money and item drops. You will only see your own item drops, not anyone else’s. It’s a good system. You can then choose to either keep those items, filling up your inventory quickly but netting you some money if you sell unnecessary ones to a shopkeeper or other player through chat, or you can use Salvage Kits to break those items down into component materials. Those materials are the ones you’ll need to buy armor and such with, and are more convenient to store than piles of different monster drops are. You do need to keep buying Salvage Kits, though. They need to get money from you somehow. In E3 for Everyone the basic inventory and item-drop system was in place, though changes would be made to how the crafting and crafters work in the betas and release; see the Crafter screenshot below for more. So, no grind for experience? No grind for potions? No artificial mechanics restricting exploration such as limited mana and, again, potions? And yet, at the same time, a game with a high skill ceiling and significant challenge if you want it? It’s amazing, but all true! Guild Wars is an online RPG specifically designed to not require inordinate grind, and to be fun and competitive for all players. Skill and playtime are both rewarded, but it’s nowhere near as unbalanced as many games. Awesome stuff. 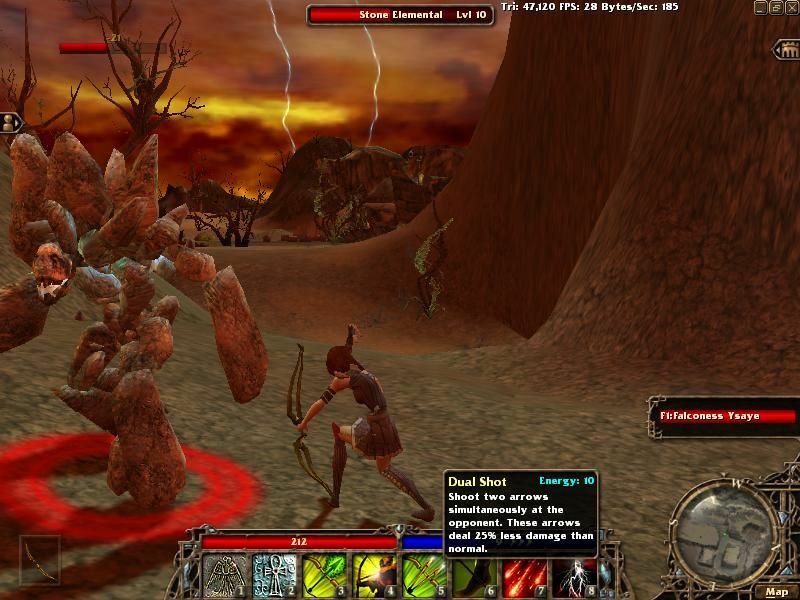 The game has three main aspects — towns, player versus enemy exploration areas or missions, and player versus player areas. Now, the game is not an MMO, because the main world is not “massively multiplayer” — gameplay areas are all instanced, while you will see other players in towns. First, towns are the only place you will encounter random other players. Everyone is not together, though; once a certain location reaches a certain number of players it splits to multiple “districts”, or divisions of the server. You can switch between districts at will with an on-screen menu if space is available, to meet with someone, but this helps keep the server and graphical load down while letting as many people go into towns as want to enter. The rest of the time, though, the game is instanced, with your party on its own server fragment. This means you will only see your party in missions, which is fine with me because it allows a more player-responsive world. In an MMO, because everyone is in one world, everything has to reappear constantly, so that other players can interact with the enemies, do the quests, and such. However, in Guild Wars, while you are in a play zone it keeps its state for as long as you are in the zone. This means that enemies you kill in Guild Wars stay dead for as long as you are in the zone, which is awesome and plays a huge role in the game! Guild Wars’ Player vs. Enemies (PvE) game is built around this, in fact. When you kill enemies, they die. When you die in an exploration zone, you get a 15% death penalty, which reduces your health and mana, and respawn at the closest resurrection shrine. Your DP (Death Penalty) maxes out at 60%, which is a quite harsh penalty that makes progress difficult. In a story mission you still get death penalty if you die, but the party won’t auto-resurrect, so you only come back if someone in the party stays alive and resurrects you. If your whole party dies in a mission you are sent back to the mission starting area and will have to try again, so they have even higher stakes. Missions also have cutscenes that tell the story, though it is entirely linear — you can’t make any choices in Guild Wars, unfortunately. In Prophecies, missions and exploration zones are entirely separate. The later chapters would blend this by allowing you to freely enter mission areas as exploration zones, but that isn’t possible in Prophecies. Several years later they would even add a Hard Mode, with an option which keeps track of if you kill every single enemy in a zone. I haven’t done that as it is quite difficult, but I do really love the semi-permanent nature of killing enemies in this game. Zones in Guild Wars are large, but you do not have totally free movement. Instead, you can only go through free areas. You can’t jump off cliffs, swim in the water, or such, and there are invisible walls in some areas blocking things off. Usually the game uses visible ‘walls’, such as water, cliffs, or such, but corners of paths to go up a cliff face, the edges of beaches, and such often have invisible walls. Zones, either in exploration areas or missions, are widely varied in design. Some are mazelike nests of corridors, while others are simple loops or consist of large open spaces. I absolutely love Guild Wars’ level design, myself. The restrictions on movement don’t bother me, because figuring out how to explore areas is part of the fun! And it’s a lot of fun. One of my favorite things in this game has always been exploring a new zone, and figuring out its paths and secrets along the way. Even if side paths lead nowhere, I need to explore all of them… and that was as true here as it has been ever since in this amazing game. The game has great in-game mapping as well. There is a nice on-screen map in the corner, and in the released game you can also open a second map which shows what exactly you have explored, with a line showing your path through the zone. This version did not have that yet, but even in this first alpha, in addition to the minimap there was a full-screen map showing the whole map available to explore, with areas you have explored shown in detail. I didn’t take any screenshots of it unfortunately, so anyone interested will have to find a picture of that online. Still, mapping is important to me in this kind of game, so the exploration, mapping, and that enemies stay dead while you are in a zone are all very important parts of why I like this game. The full Guild Wars game, later re-titled to Guild Wars: Prophecies, has seven major areas you travel through, or eight depending on how you count. The E3 for Everyone alpha has one, Post-Searing Ascalon. All Prophecies characters start in Ascalon, the games’ only medieval-European-style country, but it has been destroyed in an apocalypse. This first test does not show how the country was destroyed though, that would come later to us in the general public. It’s a unique setting for a fantasy RPG though. This first test had a whole lot of post-Searing Ascalon available to explore and fight monsters in, allowing for a lot of hours of play. There were a bunch of missions too, organized pieces of the story telling of the aftermath of this apocalypse and what your characters do from this early point in the game. And for PvP play, the test had an arena where you could fight other random teams of four, and the Tombs of Drascir, a chosen-teams PvPbattle mode that was the precursor to the Hall of Heroes. I either never reached that place on the map or got there but didn’t take any screenshots of it, though, because I have no screenshots of the Tombs of Drascir outpost or mode, unfortunately. I did play the (random) Arena some, but didn’t take many screenshots of it. One of the arena is below though. It played like 4v4 Guild Wars random arenas always have, just on a map that would not be in the final game. For this first test, I almost exclusively played as a Ranger that I named Falconess Ysaye. Now, Guild Wars requires all character names to be made up of at least two words separated by a space, and it does not have an automatic name generator; you need to come up with names yourself. All names must be unique of course, so you can’t use a name anyone else has taken for their character. Of this character name, the first part references my usual online handle name but changed for the characters’ gender, and the latter is a character name from a book I had read recently at the time. I chose a ranger because the class sounded cool, and in a game like this you need to choose a character and focus on them, so playing as one character seemed like a good idea. I still do still have a character of this name, though they would not end up being my post-release main. Still, rangers are great! I should note though, in this alpha each character class and gender combination had only one outfit, which is why everyone looks the same. You could change colors, but not design. This would change later of course. After creating a character, you went into a tutorial area which taught you the basic controls and such, before sending you to the city. I didn’t take screenshots of this, unfortunately, but there are a few in the later 2004 betas, as versions of this tutorial were in the game for a while. After finishing it you were sent to Khylo to begin the the main game, as seen below. First though, because apart from the four screenhots I took out of order to put earlier in this first article (for narrative purposes) I prefer to put things in order, exploration. Then next, shots from the town and in co-op missions. This explorable zone is The Ascalon Wilds, the E3 version’s name for the area outside of the main town Khylo. The E3 for Everyone version of this zone was removed between this alpha and the next public test and was replaced with Old Ascalon and the town with Ascalon City. Those are the versions of these zones you can play today, but I remember this much boxier version of the zone well. 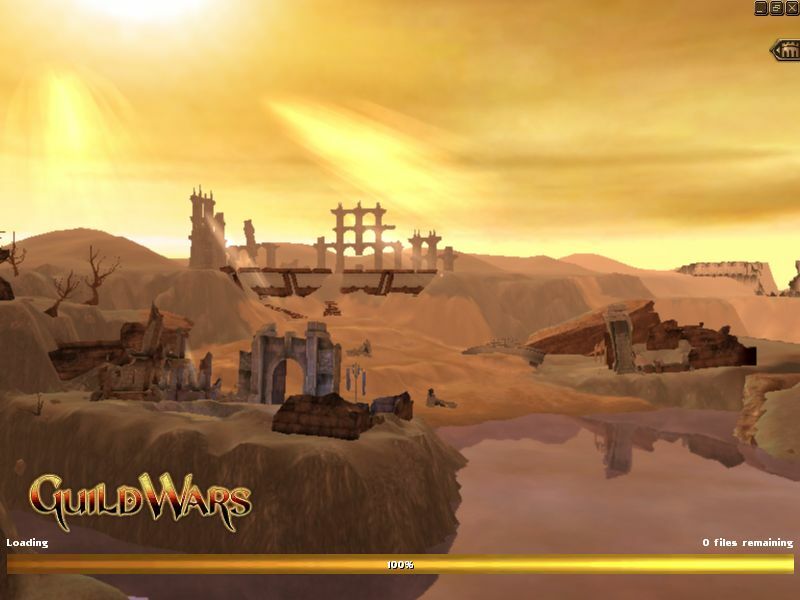 The original Wilds zone fits with the visual look of most of the rest of destroyed Ascalon better, perhaps, than the redone release version of Old Ascalon does, which makes sense considering that the Ascalon missions and the unchanged zones were present in this test, while the redone areas were added later. There are a lot of parts of Ascalon that look like this still. This is one of my favorite Guild Wars screenshots, it shows the environment and really cool sky well. Also note the framerate and triangles counter in the upper right, it’s often amusing to see what numbers that system got. It rarely hit 30. Casting Firestorm on some gargoyles. My character is a Ranger-Elementalist, so I had Firestorm. Stone Elementals were in this version of the zone too. I remember enemies chased you an absurdly long way in this test; once I ran along the whole length of the Great Northern Wall trying to escape some enemies, only to eventually be caught. Shooting an Elemental at close range by a barren hillside. Also, one thing any Guild Wars player should notice is that the minimap here doesn’t seem to have a circle around your character showing the range at which enemies will attack you. It’s a really useful feature they added later on. The U-key map with its where-you’ve-gone tracker also was not in the game yet. Dead Gargoyle, live Guard Captain. Note how both of our legs sink into the ground; either that’s sand there, or the collision here isn’t quite right. Heh. Looking at the entrance to Khylo, the main town in Ascalon at this point in development. The hazy thing in that doorway is a portal which will transport you to the city. It would be renamed Ascalon City before release apparently because they thought Khylo sounded too much like Cairo. As with the Ascalon Wilds/Old Ascalon, the town was entirely redesigned before release; in E3 for Everyone it was very fortlike, with tall stone walls all around and crafters standing on platforms. Khylo. Sometimes the textures would mess up, as you see here on my character. As you can see when this happened the framerate got much worse even with not much going on on screen. Also, I like these bits of old chatlog… even though people knew their characters would not be kept to the next test, trading went on right to the end! Also, yes, the game did not have any built-in trading interface, so you just had to use the chat to advertise that stuff. Part of Khylo. 18 active districts… Guild Wars was popular right from the start! 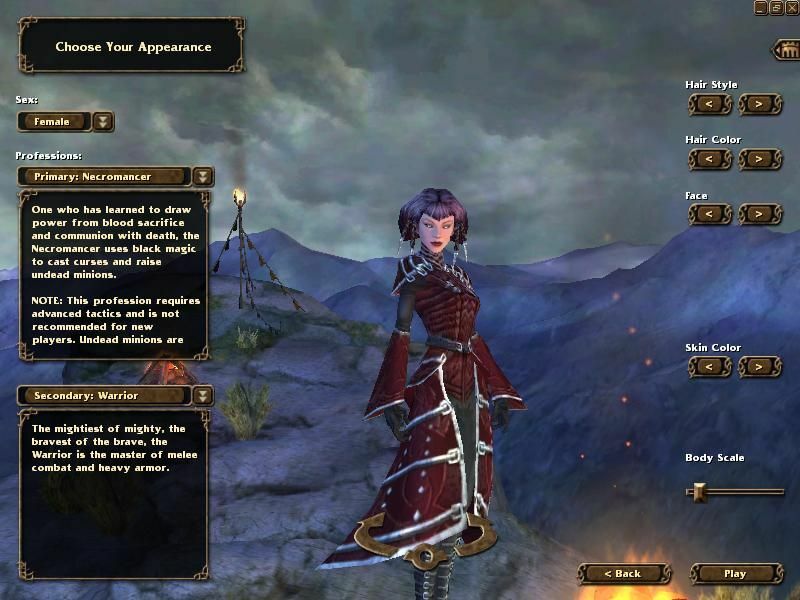 Guild Wars did not have AI companions yet at this point, or even Ranger pets or Necromancer undead summons, so in E3 for Everyone you had to go alone or with other human players when in exploration areas or missions. The explorable areas in this test could be attempted alone, but this game is designed to be played in a group, so in missions playing with other people was absolutely essential! This is a player group I was in a mission with. Another angle, taken just after that last shot, of the mission lobby, before we set out. The mission started. Before moving forward though, I took screenshots of the left-side interface, starting with the Hero panel. Here you view your stats and can choose which skill lines to put points into and thus improve the function of. At this point the menu interface was on panes you opened on the sides of the screen, instead of the movable windows they later went with. These four were on the left, and graphical options and such are on the right. I don’t have a picture of the right-side options menu from this test, but I have the left ones here. As I go through the betas the changes to the interface are interesting to follow. I really like the detailed artwork around the minimap and skill bar in the E3 version here, they look great! Also, again, there was a level 15 cap during this test. You could get experience for skill points to get skills with, but that’s it. It was a good introduction into how unimportant levels are in the game. The simple single inventory screen of this version is in some ways easier to manage than the multiple-pane one of the release game. The crystals seen in my inventory were used to get skills with at this point; this system would be removed later, along with the skill rings, but it’s cool to see them here. You can find more information about how buying skills worked in this test on the official Guild Wars Wiki’s E3 for Everyone page (link at end of article). Most skill icons have not changed, but the skill selection screen sure did. That healing signet skill would also eventually be replaced with class-specific healing skills, but the resurrection signet is still in the game as are those Ranger skills. The questlog. All three of these quests are E3 for Everyone-exclusive quests, which do not exist in other versions of the game as is; the top was renamed, the other two removed entirely, along with the skill gem system. But as that top quest shows, yes, this is all taken in one of my many failed attempts at Stormcaller, later renamed to Nolani Academy , the fourth mission in Ascalon. This mission was HARD then, in a way it hasn’t been since launch. We’re running along, during the mission. No, the graphics are definitely not set to max… not on that computers’ GeForce2 graphics card. The card does not support the games’ post-processing effects option either, and I believe I have anti-aliasing off for performance reasons. The game looked a lot better even then on more powerful machines. The Stormcaller/Nolani Academy mission lobby. It looks the same now, with fewer people most of the time of course. I apparently tried, and failed, this mission at least ten times during E3 for Everyone. And here’s the (Ascalon) Arena lobby. I found a purple dye in the last hours of the alpha, so I used it on the pants part to see what it looked like. Waiting for the doors to open to fight our opponents in the arena… but this is the last ingame screenshot I took in this test, so who knows how we did. This version of the Ascalon Arena had a different map from the release version. I have a shot of combat in this version of the arena in the January set I will post later. That “/bug” command would be removed when the game released, but was used, and useful, up until then. I should comment on the tiny tabards. These cover characters on front and back, to mark which team you are on in player versus player multiplayer, and while serviceable are kind of silly looking. They were unpopular enough that Arena.net would later replace them with the guild capes that will be seen in later tests. I think the capes are a nice improvement over these. Not seen in these screenshots, but also present in E3 for Everyone, were a couple of test areas showing later parts of the game. You could explore some jungle and snow zones, though they had no enemies in them, and compete in a multiplayer 8 v 8 mode in Fort Koga, a defense-versus-offense PvP map that was pretty interesting. Fort Koga made a lot more sense as an 8v8 competitive mission than it does as a 4v4 random arena location as it is in the release game! 8v8 Fort Koga was removed before release but did return in the next public test, where I did take screenshots of it, so see my next post for that. And with that, E3 for Everyone ended. I had played several dozen hours over the four days of the test, far more than I initially expected. If there was a time-played command I did not take note of it yet, so I do not know how much time I played this beta, but it was quite a bit given the four-day time limit. The next test would be almost six months later, in late October. 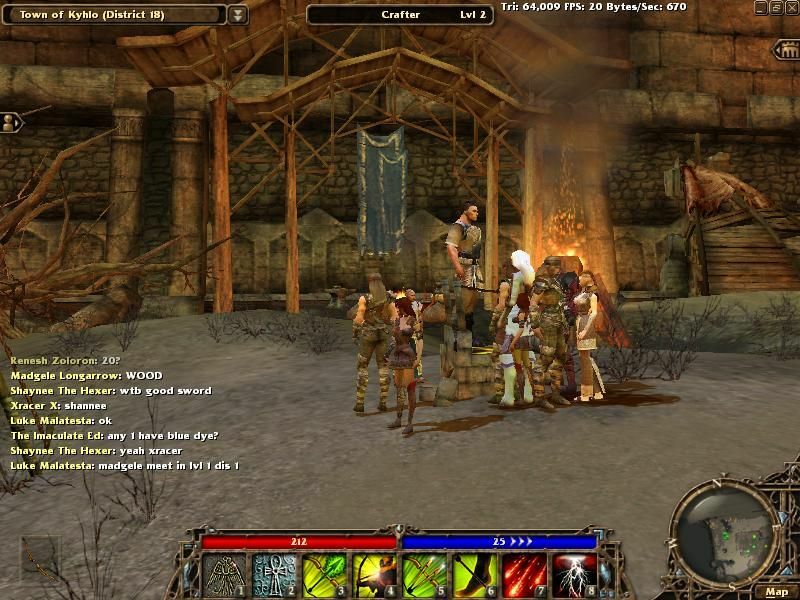 At that point monthly beta tests would begin, with one each month from October until the game released in May 2005. I played in all of them, and will post screenshots from those in subsequent posts in this series. I have never been hooked to a pre-release game like I was with Guild Wars! Over the course of the year from E3 for Everyone to launch, despite the very limited number of days the public could play the game I played a good 150-200 hours of this game, and thought about it a lot in the month between each test. From the graphics to the music to the gameplay, this game is amazing in ways nothing else has matched, and that all began with E3 for Everyone. Again, I will continue this with screenshots from those beta tests, then some from the released game as well later on. As a fan of this game I find it really interesting to look back at the games’ evolution before its release, so I’m really happy to have all these old screenshots; the game was different in a lot of ways, as I reference here but not in full detail. To sum it up, some of the most significant differences between this first public version of the game and later ones include the skill-ring system with those crystals and actual skill rings, that temporary 9th skill slot, the different-looking interface and menus, Khylo and the Ascalon Wilds, areas I’d love to explore again someday, and the absence of AI henchmen companions. You can find descriptions of these things online, but finding screenshots of each alpha or beta test, clearly marked, is trickier.